I’m going to attempt to do something that I have never done before–keep my mouth shut (for a few days). I have a tendency to shout everything I know from the rooftops as soon as I know it. I tend to “overshare” what I know about affiliate marketing. 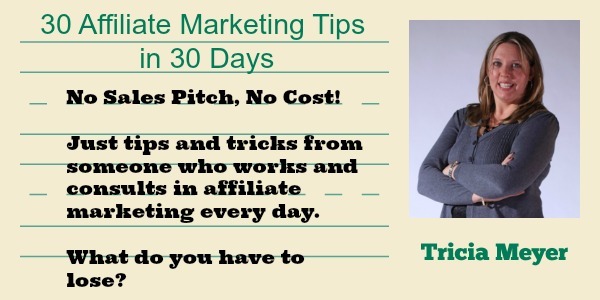 I had a great idea to write a blog post about 30 of my favorite affiliate marketing tips. After almost 10 years in the industry, I have a lot of insider information plus tried and true techniques. Why not put them all into one big blog post and give it to the world? But how would I know if anyone is actually reading and using the tips? So I have decided instead to include them in my newsletter and space them out over a month. You won’t find the list anywhere on my site. You can only get it if you subscribe to my newsletter. Am I Trying to Bribe You? Sort of. I do want you do sign up for my newsletter. But more than that, I want to engage with you. Once you sign up, I want to connect with you on LinkedIn or G+. After you get the first set of tips, I want you to email me back and tell me whether I am a genius or a total faker. I want us to be lifelong friends who eat chocolate together and paint each other’s nails!!! Well…that may be taking it just a little too far. I’m actually not much of a nail painter. What I do want is for us to see how we can help each other. If you like my tips, give me one of your own. If you are reading my site, tell me about yours, too. Quite a few reasons. One is inspired by the back story as well as the actual post Story Time: All Cookies Are Not Equal. Everyone is at a different stage in the growth of their affiliate marketing businesses. I want to be a part of the solution in helping each other grow even when times are tough. Another reason is that I have a lot of information in my head that I forget to share until you get me talking about it. Sit with me at Affiliate Summit and I may go on for 2 hours about the best ways to get higher commissions (see what I mean about how I can’t keep my mouth shut?). This is my way of informally formally putting those type of discussions into one place. Selfishly, I want to grow my list. If I keep posting everything for the world to see, you don’t have any motivation to sign up and connect with me. Now you have a reason! What’s the worst thing that can happen? You sign up for my list and start getting the tips and find them useless and unsubscribe. That’s okay. You tried. I tried. What’s the best that can happen? You learn something new. I make some new friends and learn from you, too. Sign up for my newsletter below! Tell a friend if you think they would be interested. Expect a series of three emails in the next month, each with 10 tips. And when you sign up and get that first email from me, please do respond and tell me a little about yourself. I’m anxious to hear from you! Wayne Dyer once wrote that- ‘when the student is ready the teacher will appear”. For the last two years I have been running a terribly boring website and b2b also of medical products that even tough they are unique to the market I find myself knocking on doors that just will not open. Right now I am just bored and recently I have been researching for something new that It can be done from home and I think I found it- Affiliate marketing, I have been a marketing consultant for many years but solely business to business, so I think this can be a good fit. And regarding my quote of Dr. Dyer, today I found your site and I am truly soooo ready & excited for the chocolates, nail painting and to learn from you!!!! My business partner and I are coming up with a very different style of t-shirts designed for tourist here in Central Florida , we are only 20 minutes from Disney & Universal 🙂 This morning (yup) we decided to create a new website for the t-shirts, so finding you today online is truly amazing. We just left Disney on Sunday and are anxious to get back there next year. Looking forward to see what you have come up with! Thanks, Tasi! I use a lot of different tools for automation. I see you are using ShareASale. They have good internal tools for building product widgets. I also use GoldenCan, PopShops, and the datafeeds directly from the merchants. ForMeToCoupon also just came out with something new for bloggers. Lots of great options depending on what you are looking to do. I would very much like to be added to your mailing list in hopes to learn more and gain finical freedom someday. Thank you for your time and I look forward to receiving your newsletters. Thanks for the offer Tricia…can I skip the nails part? You can paint my nails, but only if you use black-and-gold polish! I’m down for the nails. Anything –as long as my brilliant friend Tricia is there! Love it Tricia. I am sure there will be some awesome info in here everyone will be able to learn from. You will not paint my toe nails. Tricia, did you notice how Greg left it open for you to paint his fingernails? He only said no to his toe nails. You are right!! ASE14 is going to be fun! !